Why do people come to us for auto repair? The answer is simple, experience, convenience, and friendly service from people who care. At Art Morse Auto Repair, we offer tune ups in Battle Ground for the latest model vehicles to the oldest cars on the road. We can do oil changes in Battle Ground for any type of car. We offer fast, reliable service by experienced technicians. Brake service needs to be top quality! We're a trusted source of brakes with many happy customer reviews to back it up. There is nothing that beats experience when it comes to auto repair. That is what makes Art Morse Auto Repair in Battle Ground great. We have been in the auto business since 1980. All of our auto technicians have extensive training and experience. Why do people in Battle Ground go to Art Morse Auto Repair first? The answer is simple, they get experience, convenience, and friendly service from people who care.Our long service experience doing auto repair in Battle Ground has given Art Morse Auto Repair a reputation of the go-to place for all your repair and maintenance needs. People come to us first because the job will be done right the first time, every time.Our experience in auto repair in Battle Ground goes all the way back to 1980. In addition to these years of experience, we back our work and parts with warranties. One of the well-known warranties we offer is the NAPA AutoCare “Peace of Mind” Nationwide Limited Warranty. This warranty guarantees parts and labor on qualifying services and repairs for 24 months or 24,000 miles.The NAPA AutoCare Warranty is a great one, but we don’t stop there. Art Morse Auto Repair also offers our own warranty of 2 years or 25,000 miles. Any covered part or labor that is found to be defective will be replaced or repaired within the warranty period. At Art Morse Auto Repair we are happy to offer warranties because we are confident in our work. All of our technicians are Master ASE certified. With over 34 years of experience we know what we are doing.Our extensive knowledge allows us to work on the oldest autos still on the road on up to the highest tech hybrids. Whatever you drive, we have the knowledge and expertise to work on it.Not only do we specialize in auto repair, but Art Morse Auto Repair also wants to maintain your auto. We can do everything from tire rotation and a quik lube to oil changes and brake repair.Bring your car in for regular tune-ups so we can keep it running smoothly. Battle Ground is home of the beloved Harvest Days Parade. Each summer the city of Battle Ground hosts a festival that includes not only a parade but also a carnival, street dance, food and craft vendors, and more. The floats in the parade are a main attraction. Each year they get more and more creative and more and more elaborate. There are floats with musicians and bands preforming, rose-covered floats, and themes of all kinds. Visit Battle Ground WA for this fun family-friendly event next summer. We have always been happy with the way we are treated and the work done on all our vehicles. This time the final bill was less than quoted always a good thing. The van runs great. There is a reason Art Morse Auto Repair has so many word-of-mouth referrals and returned customers in out local community. 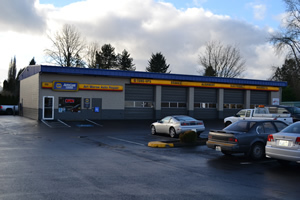 The Battle Ground area knows it can trust our 33 years of reliable service.